Happy Sunday Stampers!! Thanks for joining the RemARKable team for another Best Of blog hop. I hope you've been collecting all the Best Of sets. We had a little bit of snow earlier this week, just in time for the Best of Snow!! Here’s a complete list of the RemARKable Hoppers in case any links don’t work. 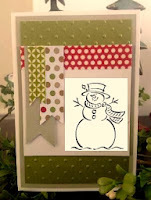 Sherri Eddleblute – http://www.sweetestdesigns.blogspot.com - ME!